The kanji that make up "Shion" (詩音) can be broken down into "shi" (詩) meaning "poetry", and "on" (音) meaning "music". Shion is young and slim. Her hair color is platinum blonde, with two pointy hair twists on the shoulder. She likes to wear white corset and elaborate silk petticoats, like an elegant upper class women of Europe in the 18th century. 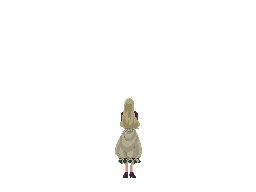 Shion is shy and introverted, but she is passion while talking about a topic she likes, lamiroir's music for instance. 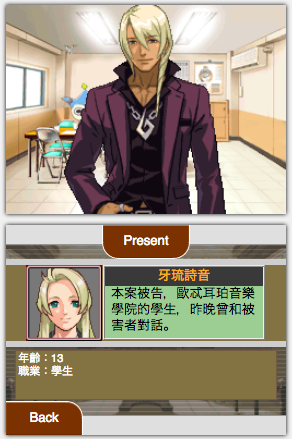 Growing up, she always idolized Kristoph as a traditional gentleman model. 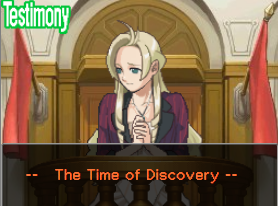 Klavier calls her "schöne Prinzessin" ("little Princess" in German). 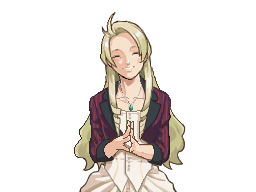 Shion is majoring in violin at Euterpe Music Academy, the sister school of Themis Legal Academy. One of her classmates were killed during school's show while lamiroir was a guest singer. 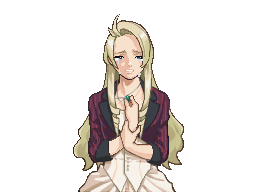 As a member of Gavin family, she did not benefit from Klavier’s glory as a famous musician, however, suffered from Kristoph’s bad reputation after the scandal -- a victim of school bullying. She's been accused of acting weird after the bully took her role as concertmaster. Rumor has it that she finally became a murderer out of jealousy and hatred. Will Wright Anything Agency take this case?